Please note that the pattern is available in an online viewing version only and there is no actual PDF offered for download. The main attraction of No Heel Spiral Socks, is the simple and scientific Idea of the elasticity which is provided by an opened up helix, or a spiral if you like: This twisted spiral is going to hug any shape perfectly, since it produces a very stretchy, skewed tube, but a well-adjusted tube that creates a different kind of sock, fitting any length of foot perfectly fine - without the need of any heel construction! This is not an original idea of mine, but it was taken from the 1938 edition of the Mary Thomas knitting book (and is actually even older). There, in one paragraph, the idea for a cuff-down sock was briefly explained without any stitch count given, or any indication of size (a common way of description in a vintage pattern). 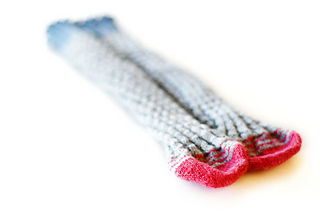 But in the modern version here, this smart idea has been adapted to a toe-up sock method that gives you more control over your yarn usage, described with a complete range of stitch counts and written out for 6 sizes and with two toe constructions to choose from (a “flat” and a “star” toe). The helix design has also been given a modern approach in both the mirroring of the pattern as well as the addition of a contemporary fun toe and cuff design in contrasting colours and an elastic bind-off for an an even stretchier fit. Read more about the story and advantages of this pattern in it’s respective blog post here - and/or watch a video with the way this sock should be put on here. And there is also a newer blog post about the two toe constructions to be read here. 277(315,336,381,391,410) m or 303(344,367,417,428,448) yards. Depending on if and how you intend to use 2 or more colours the amount for each colour might be different. C1: Children’s 9-12 / 26-30 EU = 6½ in /16,5cm foot circumference. 7 in / 18 cm foot length. C2: Children’s 1-4 / 31-34 EU = 7½ in / 19cm foot circumference. 8¼ in / 21cm foot length. A0: Women’s 5-5½ / Men’s 4-4½ / 35-36 EU = 8 in /20,5cm foot circumference. 9 in / 23cm foot length. A1: Women’s 6-7 / Men’s 5-6 / 37-38 EU = 8½ in /21,5cm foot circumference. 9½ in / 24cm foot length. A2: Women’s 8-10 / Men’s 7-9 / 38,5-43 EU = 9 in /23cm foot circumference. 10¼ in / 26cm foot length. A3: Women’s 11-14 / Men’s 10-13 / 44-48 EU = 9¾ in /25cm foot circumference. 11 in / 28cm foot length.